I'm over half way through this bin of rayon chenille scarves, but still hours of work to do yet. Today Doug is working on installing a new light in the laundry room and, for safety's sake, the computer that runs my loom needed to be shut down. Ergo, I could not weave. While it was enormously tempting to take the afternoon 'off', things don't get done, so instead of weaving I'm back to fringe twisting. My goal is to finish the fringe twisting and, if possible, get all of the scarves wet finished before I leave. In a recent conversation with another fibre person, she commented about people running 15 things off the side of their desk. Well, I do that, but I also use my dining room table...which is why there is a clear plastic cover over the hand woven table cloth that graces my table but largely remains invisible due to heaps of stuff all over it. Being self employed means showing up, even when you don't much feel like it. I'd much rather be thinking about our upcoming holiday - the first in several years. Frequently my trips are for 'business' and sometimes I can sneak in a few days here or there that might qualify as a 'holiday' - insofar as I'm not actually making any money during those days. So, a holiday. Of sorts. All too often I work at least a little bit, every day. Including 'holidays'. Yes I have been known to weave on Christmas Day. Thanksgiving. 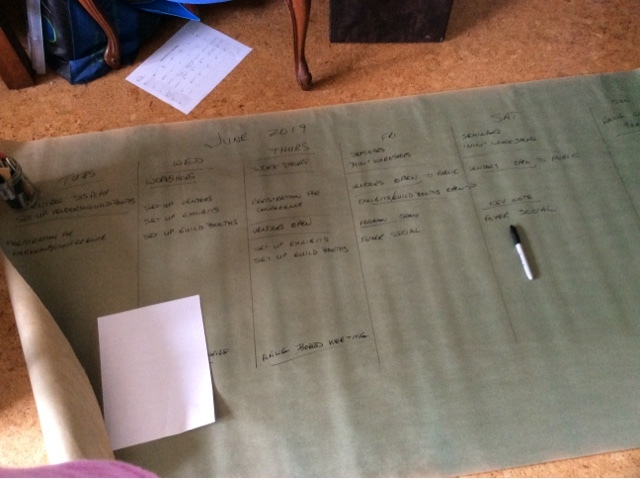 There is always some aspect of being self employed that can be tucked into a day - ledger entries, project planning, writing (like this blog - although that is more unpaid labour), research, writing. Now I will be adding conference planning. More unpaid labour. 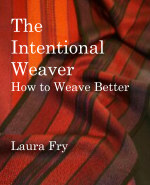 But that is part of returning to the weaving community some of the benefit I have had, being part of that community. But if I don't show up and do it - well, nothing happens. Dreams are well and good. They are a pathway. A goal. But the only way to get there is to walk the walk. Show up. Do the work. Someone asked me recently how I keep track of what needs doing when. As usual, there's not really an easy - or short - answer to that. I keep calendars where I note events coming up. Since I parse that information best by seeing it in print, I have several 'paper' calendars, plus one erasable one. The erasable one has my business/studio events and the paper ones are mostly personal. The studio ones get entered at the beginning of the year because those events are usually repeats, then when inquiries come in about teaching I can quickly and easily reference that calendar to see what I am already committed to and whether or not another event can be fitted in around those annual events. These things are my priority and I have a pretty good idea of what needs to happen to meet those deadlines, partly because I know how much prep time is needed for teaching, and how long it takes me to make textiles for the craft fairs that I do. Articles for publication can usually be fit in here and there when I have the time and inclination to do those. My biggest commitment of time and energy is, of course, the craft fair season. As I scale back we are now down to three shows a year, two locally and one in Vancouver (plus the annual guild sale, but that's not a 'major' show for me, more an opportunity to put end of season stuff on 'sale'). 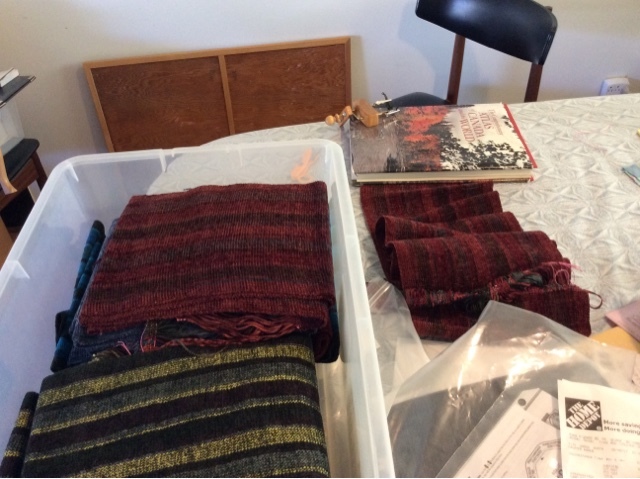 So, even though I actually wove the above bin of scarves oh, last December? Around the time mom got sick and went into hospital/hospice, they weren't needed until, well, now. They don't need pressing, so they could be fringe twisted and wet finished much closer to the sale date. BUT - I am going to be out of town more than I am home for the next six weeks or so. Which means I need to start getting the fringe twisting done now. I may not get all of it done before my first trip, but I should be able to make a good dent in the pile. Nothing like a deadline going critical to light a fire under me!!! Fighting a low grade headache today made thinking challenging. I realized I needed to see the shape of the conference so first I printed out a calendar (white sheet at the top) but the squares were just too small. Sometimes it pays to be a pack rat, and I found a large roll of (very sun faded) paper and drew out the days of the conference, which events would be happening on those days, and then wrote in which facility we would be using for each event. It's only the broad strokes, and there is still more to be done in terms of contacting some facilities, but I need to book the one hotel now, so mostly I was looking for what rooms we would need at that hotel. Even though the conference is nearly two years away, this is a small town and facilities get booked a few years in advance so we need to do this now. Once I have the facilities dealt with I can go on holiday with a clear conscience and not think too much about any of this until after the craft fair season. In the meantime workshop and seminar topic proposals are coming in so hopefully we will wind up with something for everyone. We did not send out an open call for instructors/leaders. We have, as I say, limited facilities to work with so an invitation was sent out to specific teachers. I've asked for proposals by the end of September and when I get home from Circle Craft, I should have everything I need to start slotting people into appropriate rooms, which will let me know how many people can be accommodated. Our conference team is small, so if I can do these sorts of things early, I won't be scrambling later! 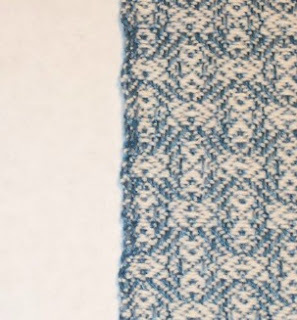 After talking at length with someone this morning about efficiency (more on that in the future) I went to the loom, finishing one colour (below - very subtle) and starting the next. The weft for the new stretch of cloth is 100% natural green, which will develop into a deep sort of sage green after wet finishing. Knowing that the higher contrast between the warp and weft would be much stronger visually, I quickly changed the treadling/tie up to something much bolder, more graphic in appearance. And as I did that bit of work, I thought about how the computer assisted dobby doesn't do anything that can't be done on a 'standard' floor loom. It just allows me to do it a whole bunch faster. I still have to know what I want and how to get it. I have to understand the weave structure I am working with and how changing the tie up and treadling sequence is going to change the effect of the interlacements/design. But instead of crawling around under the loom, physically untying and tying string/cord, a few keystrokes achieves the same thing. And instead of an hour or more, I was back weaving in less than 20 minutes - probably closer to 15. When I decided to buy the AVL in 1981 there were very few 16 shaft looms around, never mind a dobby. But my goal, right from the beginning, has been to earn an income from textiles, one way or another. With that goal in mind I wanted to work efficiently. One of the first 'production' pieces of equipment I purchased was an electric bobbin winder. The reason? It was taking me longer to hand wind a bobbin than it was to weave it off. I knew I'd starve at that rate, so since I was attending Convergence in 1978 at Fort Collins, CO, I saved up my money and bought an electric bobbin winder. I still have that winder. Well, to certain values of same! The motor has been replaced along with the foot pedal. I use it for winding bobbins, the AVL pirns for the fly shuttle when I need to use those (I also have an industrial pirn winder with industrial fly shuttle and pirns which I much prefer to use but can't always, depending on the yarn) and sometimes spools for sectional beaming. Thing is, there are options. We can each approach the craft at whatever level we want. Some prefer a slower, more meditative practice (although for me weaving has always been a working meditation - I just do it a wee bit faster than most). Some prefer to follow directions. Some like to experiment, some to take a more research oriented, experimental approach. Some like to make a lot of things because we like to eat. So to speak. All of these approaches are completely and totally valid for that person. We each get to choose. There are options and we get to decide our path, our processes. 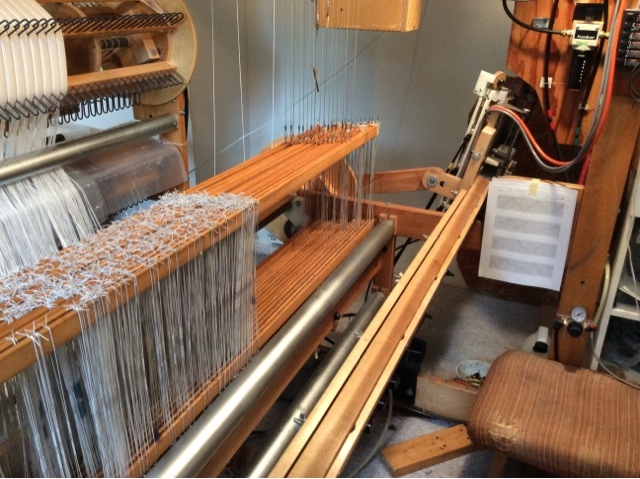 It's one of the things I really love about the practice of making textiles, be that on an inkle loom, tapestry, 'standard' floor loom or other textile practices like bobbin lace (really just another kind of weaving), knitting, crocheting, felting. Etc. Most fibre craftspeople do more than one craft. That was one of the reasons we chose Confluences for the theme of our conference here in '19. We are looking forward to the confluence of many different textile practitioners and how they combine different fibre crafts. Yay for options! I have been working hard for a few weeks now, weaving pretty much every day, at least two sessions, three if I can. Today I gave myself a day 'off'. The picture shows some of my hand spun, most of it spun this summer in the evenings at the guild, then plyed. I use it for knitting. Spinning and knitting are my hobbies. I don't sell either - rather I make scarves and shawls and donate them to causes that are raising money. Or they get given as gifts. My poor southern friends, freezing in the chilliness that is Alberta in June each got one. Right now my spinning stash overflows into my dining room and I want to put it all away while I am busy in the autumn and will have very little time to actually do any spinning. 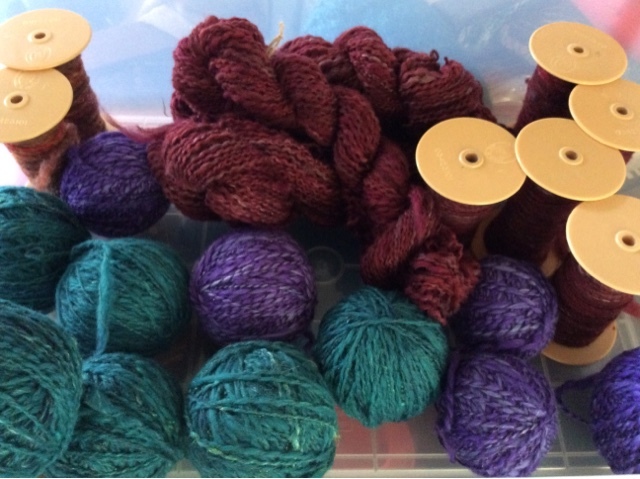 So today I dug into the plying, finishing the blue I'd begun yesterday, plus doing five spools of a rich red. 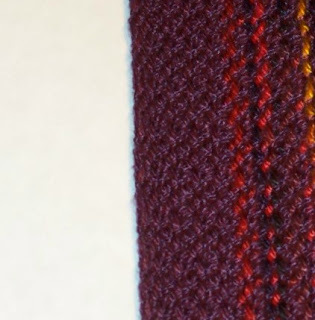 I have five more spools of a slightly different singles red to ply and I think I will use the same extremely fine tram silk to ply that as well as the one in the photo above, which is actually more red and less rust. I doubt I will get the bin of rust rolags spun up before I go away, but I might. Mostly I'm tired of looking at that heap of spinning fibre and just want to clear some of the clutter out of my living space. So the bags of fibre will go back down to the studio until I'm ready to make more rolags and begin spinning again. Hopefully when I get my Questionable Origins e-spinner. Currently reading L. E. Modesitt, The One-Eyed Man. I've not read him before and am only in the first few pages, so I will see if I go looking for one of his series. Because I'm running 'low' on fav authors! It has been about exactly 2.5 years since the by-pass surgery, so a little over 3.5 years since I started to notice that things were starting to deteriorate. I was warned that recovery from such surgery could be 2-3 years before getting back to 'normal' - whatever that might be, given I'm also that much older now and lost so much fitness during the lead up to, then the recuperation from, the surgery. I have been trying my best to regain as much of what I 'lost' as possible, which was a bit of a struggle given the renovations which disrupted not just the outside, but the inside, including my studio. Which still isn't quite back to 'normal' with a few more small jobs needing doing. But those are inside so Doug has been concentrating on getting the outside as finished as any house ever gets. The AVL sat, neglected, while I dealt with regaining my fitness, dealing with travel to teach, dealing with mom and the aftermath of that, then more teaching, also trying to write a book (currently on hold). 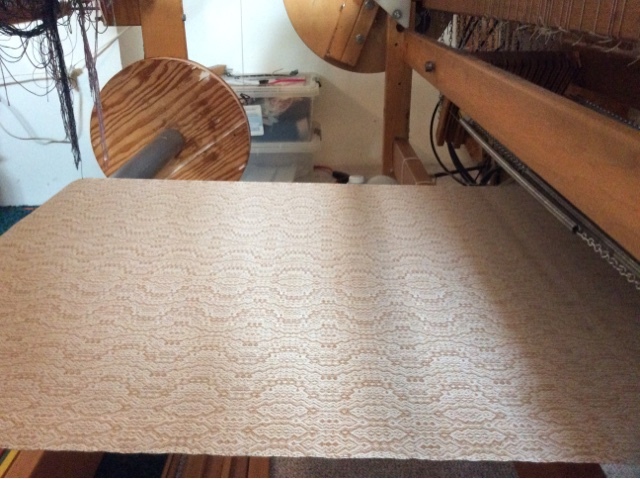 But since coming home from ANWG in Victoria, I have managed to complete the conference cloth (aka the Neverending Warp) and put this warp for table runners onto the loom. 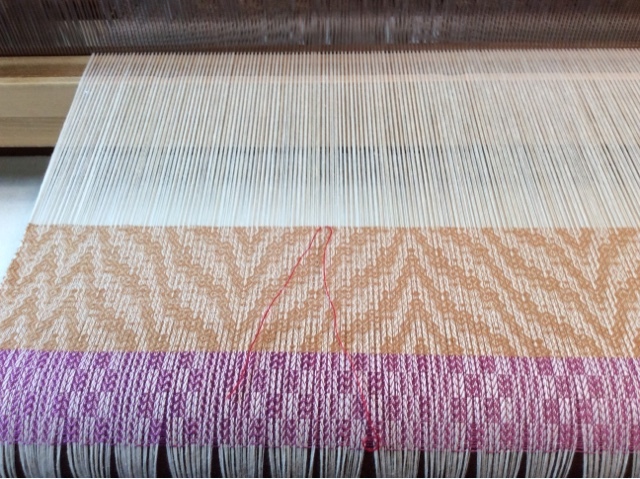 The conference warp was woven as tea towel 'blanks', each one taking about 30 minutes to weave. I tried to do three a day to build up my weaving chops on the AVL - which takes more effort, physically. This warp however is continuous while I use up the Fox Fiber naturally coloured cotton, so I am doing 45 minutes, finishing on a repeat. Weaving on the AVL for 45 minutes at a time is aerobic for me. Recently I did a rough and ready calculation, and I seem to be weaving about 36 picks per minute including bobbin changing, tail clipping, drink sipping (hydrate! ), etc. So my weaving rhythm on this loom with this yarn appears to be in the 40-44 picks per minute range. And yes, I work up a sweat doing it. The beater is heavy and pushing that thing back and forth on average about 40 times per minute? It's aerobic. I may not be jogging or on the elliptical or treadmill, but if your heart rate increases and you break a sweat? That qualifies for aerobic. Most of all, it feels incredibly satisfying to see the cloth roll onto the storage roller, the yarn getting used up, and feeling like I'm pretty much as good as I'm going to get, given my age and overall health. I was supposed to have four threads left over when I'd done threading this warp. Hmm. Six. With 764 or so ends in the warp, a fairly straight forward but 'fancy' 16 shaft twill, I have no idea where the error is. So I have sleyed and tied on and am now trying to find the mistake. And it's hiding. 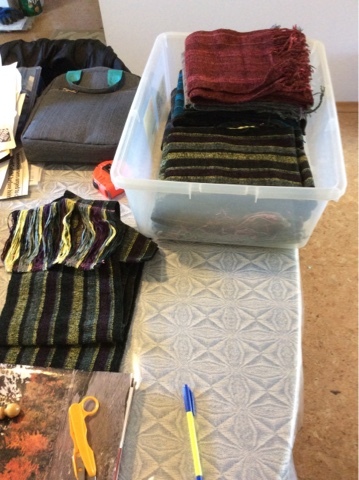 In the process, I discovered that the computer that runs the loom has suddenly disappeared ALL of my weaving files - except for the warp I just finished weaving. I spy with my little eye...two empty heddles just to the right of the red thread. 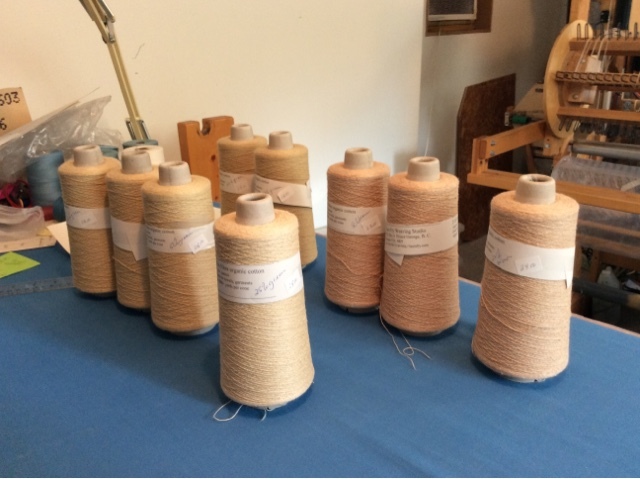 The solution is 'easy' - add two spools of the warp thread, enter them into the empty heddles, which is where they belong, obviously, move the rest of the threads 'over', re-tie and continue. 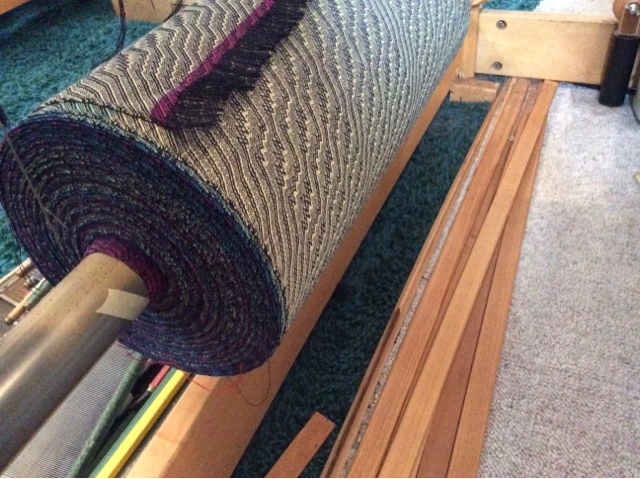 With deadlines looming (yeah, I know) I can't waste any time so the table runner warp is going into the loom right away. There was time yesterday to get it beamed, this morning I was busy, and this afternoon I am threading. I usually do more complex designs/patterns because I do have 16 shafts and this will be no exception. 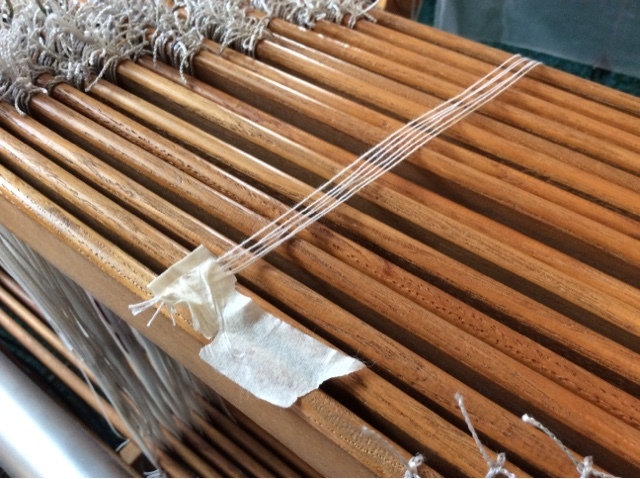 The pages taped to the side of the loom (three of them) show me the thread by thread sequence of the ends. All 764 of them. It will take me about three hours to thread - hopefully with no errors! - so with any luck at all I will get it mostly done this afternoon and finish the rest tomorrow morning. Then another hour or so to sley and tie on and I should be ready to weave after lunch tomorrow. My first priority on this warp is to use up all of the 18/2 Fox Fiber naturally coloured cotton. I figure I have enough for about 40 yards of weaving. (You get a lot of play time with finer threads!) 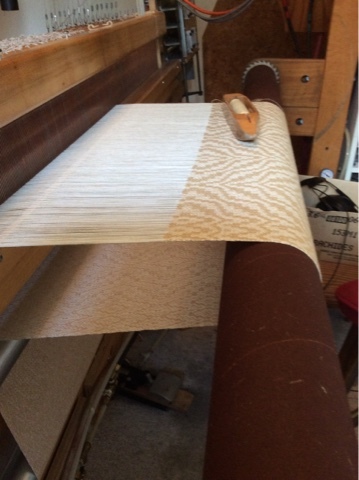 The warp is 50 yards long because when I'm done with the Fox Fiber I will use some singles linen in half-bleached, which should look quite elegant on this natural and bleached white (well mixed) warp. Today I declared the warp for the conference 'done'. There is very close 65 yards of fabric on the cloth storage roller. The cloth will be used for various conference purposes, such as decoration, name tags, souvenir tea towels/thank you gifts. Some people don't realize just how far in advance preparations for such an event begin. We actually started last year, booking the Civic Centre and our keynote speaker, Abby Franquemont. Since then we have been in discussion with other instructors and are beginning to receive their information. Yesterday we toured one of the hotels near the Civic Centre and reserved all of their meeting rooms. Once I have all of the instructor information (maximum size of class, audio/visual aids required, other equipment such as sinks, etc.,) I can begin to slot instructors into appropriate rooms. Our aim is to make this a quality event for all participants. It's going to be a bit of a challenge because we are a small town, but it is a small town with a big heart. I am living 'dangerously' with this warp. I'm so very nearly finished this warp I don't really want to cut it off until it is done, done. 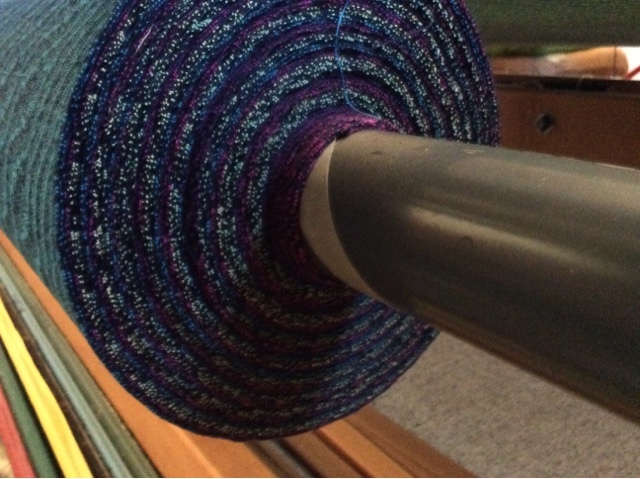 But that means the cloth roll is probably the largest I've ever put onto the loom. Well, one of the largest. This warp began to feel like it was never going to end. It was put into the loom last fall, around the time the house renovations began and a few months before mom got sick and died, which meant my life got totally derailed. I worked on the warp in fits and starts but 100 yards or so of warp at 32 ppi takes time. In the same way the view count of this blog has added up, one view at a time. Around 10:30 am today the total views rolled over the 1.3 million mark. Never in my wildest dreams did I think that I would ever have that kind of following. I'm a bit of a heretic and my views are not always well received and I've had my share of controversy over the years. But this blog was begun as a celebration of life. My life, in fact. I'd just come through some nasty health issues and was on the road to recovery and several friends had been urging me to start a blog and I thought, well, why not? And so I began. And almost 9 years on, here I still am. I consider myself fluent in English - it is, after all, my 'mother' tongue. I also have a pretty decent grasp of British and American variants of the language with a smattering of Aussie and Kiwi tossed into the mix, partly because I read - a lot. I grew up reading British children's stories as much as I did American. One of my very first favourite authors was Enid Blytton (sp?) I have always watched a lot of British tv programs, especially history or science, but also generally. I also speak weaving with a smattering of spinning, some bobbin lace, knitting (although my knitting language skills are pretty dated) and embroidery. I believe that language matters. If we do not use language that we all understand, then communication becomes more difficult than it needs to be. In my humble opinion, of course. Generally I try to use correct words for weaving and spinning. 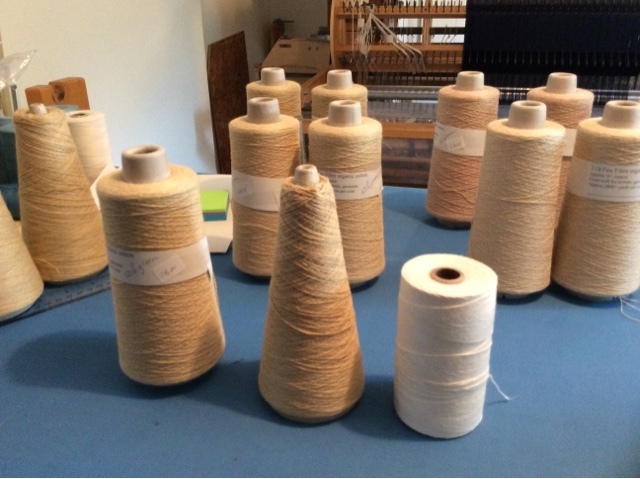 For example, the two yarn packages to the left in the photo are cones. The yarn package to the right is a tube. Or spool, although I feel that a spool should have flanges to be truly accurate. But at least I can understand when someone asks me for a 'spool' of cotton - I'm pretty sure I know that they want a tube. The internet is written communication. Therefore I try very hard to not only use the correct word, but to spell it correctly. It's 'sley', not slay or sleigh. It's 'treadling', not threadling. (Do they mean threading? Or treadling? - Sometimes context will give meaning, but not always.) And a pet peeve is 'dying' when people mean dyeing. Auto (in)correct plays havoc on technological terms but it can be taught. I've managed to get both my ipad and my new phone (mostly) to at least give me the weaving term option. If the use of 'proper' words isn't important, then it isn't important. To me it's very important. Since I now appear to be officially below the 20 yard mark of warp left to weave on the AVL, I have been doing the number crunching for the next warp in the pipeline. In the spirit of stash busting, I am putting a white-ish warp on (natural and bleached whites, well mixed) of2/16 cotton and will be attempting to use up all of the Fox Fiber naturally coloured cotton left in my stash. There are various percentages of the natural colour with white pima cotton and after wet finishing these differing percentages will develop to different values of the green or brown naturally coloured cottons, so I don't want to mix them up. 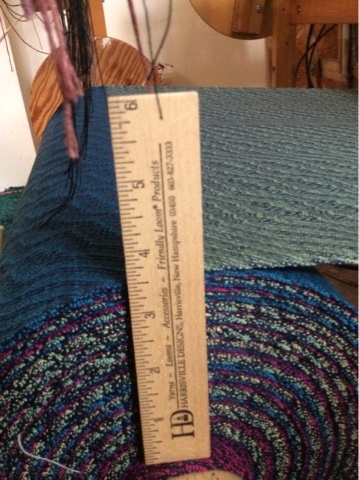 Yesterday I grouped the various percentages so that I can keep them separate and then did the math to figure out how much weft they - in total - were going to provide. Approximately, of course. To the best I can determine there is enough of this yarn to weave off about 30 yards, so my plan of putting a 40 yard warp on seems sound. I also have some half bleached linen (singles) that I can use to weave off whatever the Fox Fiber doesn't use. There has been some discussion on the internet about how much experience someone should have before they teach. And whether or not one should give unsolicited advice when you see someone doing something awkwardly. I have learned to not jump into someone's practice unless I feel they are doing harm to themselves - i.e. not working ergonomically. I may suggest their posture should be adjusted, or that they might find themselves more comfortable in a different chair. But I try very hard to not poke my nose into someone else's practice unless they express frustration. People generally don't do things that make them unhappy so anything I say probably won't be well received. How do I know? Because I used to offer advice. And it wasn't well received. I'm not talking about when I'm actually in a classroom teaching, I'm talking about 'social' situations. But even then, I tend to do group demonstrations, listen to the comments, then quietly and hopefully tactfully, comment on the student's one on one. Rather than jump into discussions on line much (and only if I feel what I say will be welcome) I have made a bunch of video clips showing various things that I do. People routinely observe at how much I get done. Well, if people like my results, they might like to study what I do and accept, adapt (or reject) what I do. But most of all, I encourage people to figure out what works for them, what gives them the results they desire. In order to get 'perfect' selvedges you must use a floating selvedge. In order to get 'perfect' selvedges all you need is an end feed (or delivery) shuttle. In order to get 'perfect' selvedges you must have a plain weave interlacement, regardless of the weave structure of the body of the cloth. Well, those things are all well and good if they actually address the issue of the 'poor' results. There are so many ways selvedges can go wrong. Beaming. In my experience a warp weaves off much more nicely if it is beamed under tension - at least as much tension as will be applied during weaving. Warp packing. In my experience warp packing should be firm enough to prevent threads from upper layers from cutting down into lower layers. 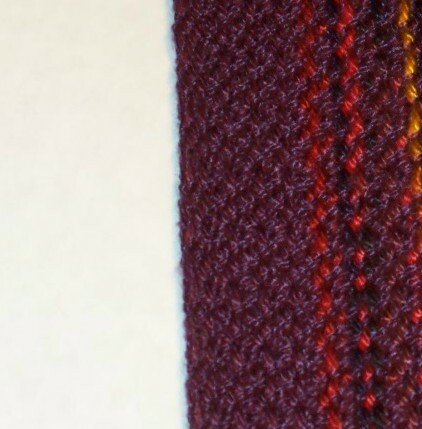 In my experience warp packing should be several inches wider than the warp to prevent ends from sliding off the warp packing and causing issues with different length/tension from the rest of the warp. In my experience tensioning the warp as consistently as possible makes for better selvedges and body of the cloth than being wildly inconsistent. Shuttle handling. In my experience I get more control over the weft pick by holding the shuttle cradled in my fingers, not gripped from above. 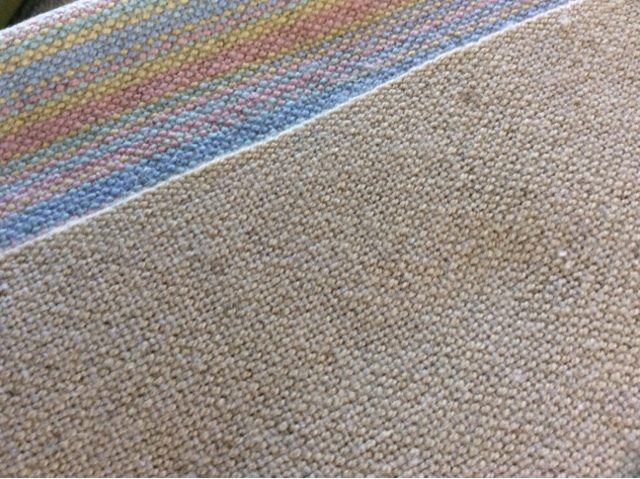 So in the above photo, the edge of the beige is, in fact, the selvedge. The weft is a reasonably smooth yarn, so all in all, it makes a nice tidy consistent selvedge. But I get pretty much the same result with a 2:2 twill selvedge. And no, I don't worry about a 2 thread float. I don't even particularly worry about a 3, 4, or 5 end float. I remember the first time someone on the internet called me an 'expert'. Because even knowing how much I knew, I knew there was so much more to learn. So what makes an 'expert', and who gets to call themselves that? Well, first of all, I think that the term 'expert' is not a mantle one dons for oneself. Rather it is something that other people recognize and acknowledge about the knowledgeable person. To me an 'expert' is someone who knows something in depth because they have studied it. In terms of a craft, it also means that they have some sort of control of their equipment, processes and materials. But just because you are an 'expert' doesn't automatically make you a good teacher. Someone can be all kinds of expert in something and not be able to communicate how or why they do what they do. An 'expert' usually has developed resources. 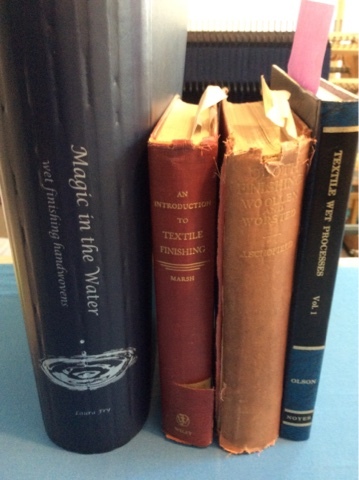 In my case I have dug around finding books written for the textile industry. No, I have not read them all. But I have read portions of the three books to the right in the photo above that pertain to what I am trying to learn. Eventually I became my own 'expert' in terms of the type of textile I wish to make. Abby Franquemont has begun doing live video chats via her Facebook page. I agree with her on her take about expertise. I look forward to viewing more of her video chats. I just wish there was a way for people to meet in real life and have these conversations. I finally made it back to the AVL and this warp today. Normally a 100 yard long warp wouldn't faze me, but this one? It's been a challenge. It began last autumn. You remember? About the time the renovations began, and then mom got sick and died. And I just got completely knocked off my feet in so many ways. I finally got back to it in the new year, but the loom wasn't behaving well and the issues became just too much for me and instead I turned to my trusty, reliable Leclerc Fanny and a very simple (plain weave) series of towels. A series that I have only just put to bed. Administrivia consumed me for a few days but today I took a deep breath - and fired up the AVL. Why do I say 'fired up'? Because the loom is fairly high tech - for hand weaving. It has the computer assisted dobby, but it also has air assist for the treadle (and fly shuttle although I'm not using that on this warp). The loom requires a different sort of effort than the Leclerc and by the time I'd gotten about half way through the second 'towel' my neck was letting me know it wasn't very happy with me. So instead of weaving three, I stopped at two. I'm hoping to build back up to three per day so I can clear this warp off the loom and put the next one on - a warp for table runners. Not only am I out of table runners (other than the ones that match the place mats) I also have a whole bunch of naturally coloured cotton that I really want to use up. So I will be combining the two goals in one. That warp will be 40 yards, which should give me a decent number of runners for the upcoming craft fairs. The warp has been crunched, the yarn pulled - I just need an empty loom.